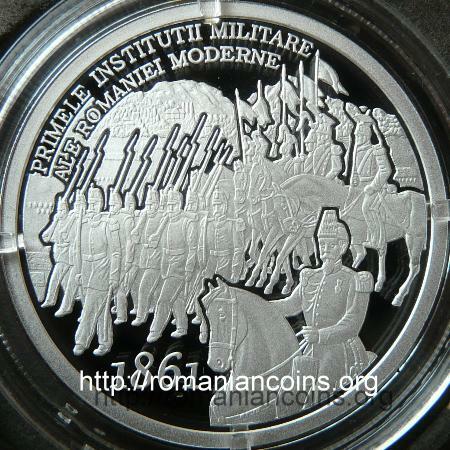 Obverse: ROMANIA, coat of arms of Romania, face value "10 LEI", year 2011, a portrait of prince Cuza from the beginning of his reign, inscription ALEXANDRU IOAN CUZA Reverse: servicemen from the army of the United Principalities in 1861: at left, infantrymen, at right, cavalrymen, in foreground a colonel from the General Staff, year 1861 and inscription "PRIMELE INSTITUTII MILITARE ALE ROMANIEI MODERNE" meaning "FIRST MILITARY INSTITUTIONS OF MODERN ROMANIA"
After the Union of the Principalities at 1859 Alexandru Ioan Cuza and his collaborators started an assiduous program for the unification of Moldavia and Walachia. New institutions were consequently created, as prerequisite for the modernization of the state. Constant measures were taken in order to strengthen the military power of the United Principalities. In 1859 the General Staff of the Army was established. In February 1861 prince Cuza approved the coat of arms of the United Principalities, intended for the soldiers to wear at the gorget. 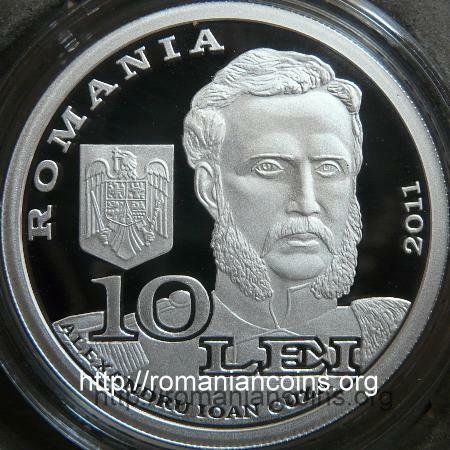 In 1860 prince Cuza appointed general Emanoil Florescu (1819 - 1893) as minister of war both in Moldavia and Walachia (the governments were, of course, still separated). In 1861 the Quartermasters Corps was established, through the High Daily Order no. 29. The Military School for Infantry and Cavalry Officers was established in 1861, by unifying the officer schools from Iaşi and Bucharest. The courses of the newly formed institution was opened only in 1862, when the new building of the school was completed. In fact, the unification was made through the disbanding of the school of Iaşi. For the unification of the two Ministries of War, in August 1861 a Cabinet of the Ministry of War was created. On 10 / 22 December 1861 the Ministries of War of the United Principallities were unified, colonel Ioan Grigore Ghica (1830 - 1881) being appointed as minister.